INDUSTRY.co.id - Aru Islands - Minister of Agriculture Amran Sulaiman plans to hold local investors for the development of Cattle farms in Aru Islands District, Maluku. "Regional budget is limited, therefore there are two other ways that can be taken, first by holding investors, second, no more imports (meat)" said Minister Amran during a meeting with the people of Aru Islands, Maluku last weekend. Minister of Agriculture Amran asked the local government and community of Aru Islands to support investment in cattle ranch that will run in the near future. "Like a visit to a man's house, if the occupants of his house fight, then guests will be reluctant to come to the house. So also with these investors, they are guests who will invest, so we must receive well (investors), because with the investor will certainly build the economy of society in the future ", Amran light. Amran also explained the reason for the selection of locations in the Aru Islands, "Because the climate between Australia and the Aru Islands border is relatively similar, here also is found Kangaroo, this is very potential for the development of cattle," said Amran. He added, "As a stimulant, we give 200 cows, then give the plasma core to the community. The community is given sires; his son was taken by the community and then after his big son was sold to investors." "If the cows do not get here, you come to Jakarta to meet me, I pay (his cow) and when the father comes, the Director of his Farm has been changed," said Amran answer questions Luther, one of the Aru Islands community leaders who questioned Minister of Agriculture's commitment to his promise. In addition to providing 200 cows, Amran also handed over 5000 chickens to be maintained by the people of Aru Islands. And to support the acceleration of cattle breeding development plans, Amran declared that he would provide cattle breeding equipment. "And we will give 10 tractors for the community which will be used together" he asserted before the people of Aru Islands, which also attended also by the Deputy Governor of Maluku Zeth Sahuburua.SH, Regent Aru Islands, dr. Johan Gonga and Vice Regent Muin Sugalrey, Maluku Police Chief Deden Juana, Dirlantas Maluku Kombes Heru, Direskrim Maluku Kombes Gupukh and Aru Islands Police Chief AKBP Adolok Bormasa. Maluku Vice Governor Zeth Sahuburua SH said at the meeting, "We really welcome the development plan of this cattle farm, indeed the location and climate here is very profitable for the cattle ranch" he said. The same thing was also conveyed by the Regent of Aru Islands, dr. Johan Gonga, "With the investors, it will certainly increase the level of the economy of the community, land that was not productive can provide benefits to the community and regional income. We strongly support this plan," he said. The previous day, Minister of Agriculture Amran also conducted a dialogue with corn farmers in Siwalima urban village, Aru Islands District. Amran targets the Aru Islands Regional Government to plant maize area which is currently only 1000 Ha, plus 5000Ha. To support that, through the Aru Islands District Government, Amran provided 10 tractors of assistance, "Regent of direct affairs, in the near future must be here" said Amran. 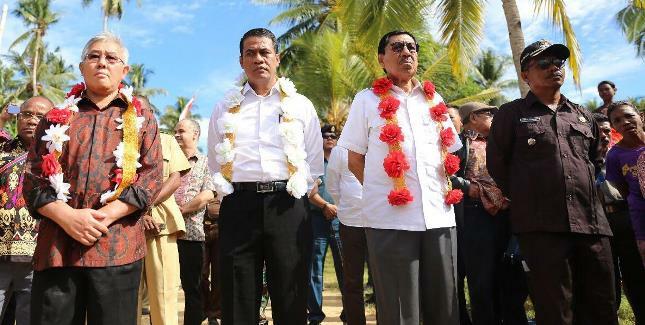 The presence of the Minister of Agriculture of Amran in Aru Islands for two days has resulted in several concrete policies, "This is our way of working, we will not come to promise if it is unclear" Amran concluded.